In the run-up to CinemaCon 2015 CJ is interviewing and profiling several leading companies, trade bodies and people to capture the mood of the cinema industry as it enters its post-digital era. Today we talk to Melissa Cogavin, Managing Director of the Event Cinema Association (ECA), the trade body representing those enabling the projection of other things than just films in the cinemas – and beyond. Celluloid Junkie: 2014 seems to have been a year of advances for both event cinema and the Event Cinema Association. What are your key observations about the field since the last CinemaCon? Melissa Cogavin: Yes I think you’re right. Following on from the successes of 2013, we saw some more record breakers with the release of the One Direction documentary (Arts Alliance) and the live Billy Elliot stage show (Universal). We saw NT Live’s War Horse in 4K delivered by Sony. We saw a slicker than ever delivery of opera and ballet worldwide, with newcomers the English National Opera/Altive Media establishing themselves in 2014. But more than that at the ECA we’ve seen interest in gaming rise and the monetisation of this genre becoming established. There are a several providers of this kind of entertainment exploiting the passion that gamers experience in tournaments and I am looking forward to seeing that played out in cinemas over 2015. TV is making an impact at the cinema too, and that’s very exciting to see. Awareness seems greater of the medium amongst the general public and judging by the diverse nature of the enquiries we receive at the ECA, interest in cinema as a release platform is growing all the time. 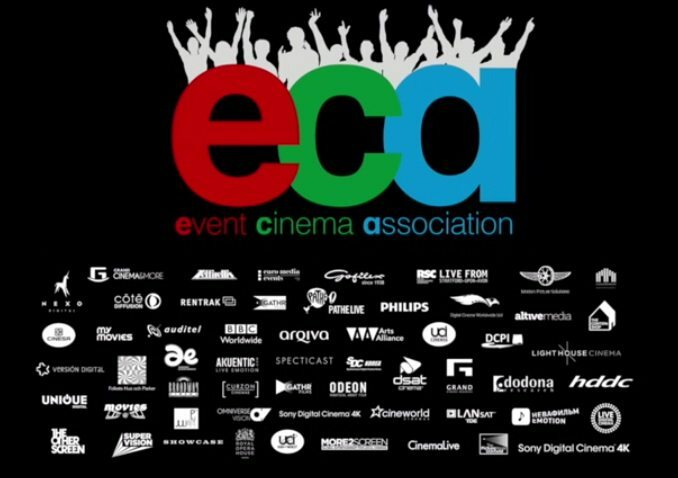 At the ECA we’ve had a year of milestones too; at CinemaCon last year it was very much a fact-finding mission and we were stunned by the level of interest at the Open House that the convention’s organisers kindly hosted for our industry. I handed out 250 business cards in 90 minutes, I couldn’t believe it. Our presence at CineEurope was unlike anything the event cinema industry has seen before and our partnership with Philips enabled us to provide a meeting space for members all week in a bespoke cinema environment, and our members had the opportunity of participate in a showreel on a cinema screen with 5.1 surround sound, running throughout the week every other hour. Our 2014 ECA Conference at the Genesis cinema was attended by 250 people from 23 countries worldwide and was a great success. We provided 6 very popular breakout sessions over the course of the day that went down very well, and in one of them we actually had a live satellite link up provided by our sponsor Arqiva based on the street in an OB truck, which was an industry first and was very entertaining! 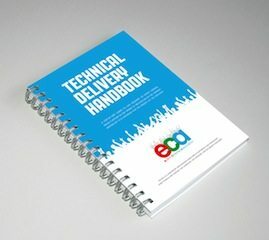 We are working on a French version of the Technical Handbook for release later in the year, and there are plans for a Marketing Handbook, as event cinema has a unique marketing methodology and it’ll be aimed at newcomers to the industry especially exhibition. We’ve expanded overseas in the last few months as well, and now have Jonathan Ross representing the ECA in the Americas, and Olivier Hillaire in France. In the UK we have taken on Nigel Dennis to help with our membership recruitment and administration, and we hope to expand in to Germany later this year. CJ: Membership of ECA has also grown significantly in the past 12 months. Is it the same type of companies joining as before or are you finding new types of members? Melissa Cogavin: Our membership has almost doubled in the last 12 months; we now have 90 members from 22 countries worldwide including Colombia, Malta and Korea. Our membership has always been a broad church and continues to diversify; but generally the membership reflects the supply chain so we have producers and directors of event cinema at one end and exhibitors at the other. But as the only trade association catering for this business and as a result it has the bulk of the industry represented in its membership, it attracts members totally unconnected to the business; we even have one member whose business aims to save its clients money on utility bills, for example. Businesses are springing up as a result of the success of event cinema and we have website designers, trailer producers and ticket selling websites also in our membership, which is a recent phenomenon. CJ: 2015 is shaping up to be a blockbuster year for Hollywood movies at the box office. Is there a risk that event cinema will be overshadowed by all the Avengers and Jurassic dinosaurs? Melissa Cogavin: Cinema, like any business, is cyclical; there are years like 2015, cluttered with blockbusters, and then a barren year may follow, I’ve seen it happen time and again over the years. It’s the nature of the business and the creative process. Not only that but let’s remember the historical context; he Hollywood studios have had a tough few years like the rest of us, so it’s only now we are seeing the release of films (that were perhaps greenlit 5 years ago as the recession stared to bite) make it to the big screen. But the studios are well aware of the power of event cinema and are getting involved now too, so as I expected, the lines are blurring and we are not in opposing camps, we never were. Universal are very supportive members of the ECA. I’m looking forward to seeing how the landscape starts to shift in this regard. CJ: Television seems to be making inroads to cinema with “Game of Thrones” on Imax screens and the two “Doctor Who” cinema outings before that. Should we expect to see more ‘small screen’ content on the bigger screen? Melissa Cogavin: I would really hope so. It seems a marriage made in Heaven. TV, especially US produced TV has become more filmic and high budget, and the quality is superb. The viewing habits of the public have changed with the advent of VOD, so binge-watching box sets is now commonplace. The result is a fanatical fan base that will very willingly dress up to go to see their favourite show on the big screen, surrounded by likeminded fans, and with some added value such as a Q&A or exclusive content, the possibilities are endless. It will just take time for the various parties involved to come round to them. I’d like to see UK TV season finales exploited at the box office as well – it’s been done before but we haven’t seen that for a while. The cinema is the only platform where you can embrace that shared experience and feed off the energy of others in the auditorium with you. CJ: How is event cinema doing in the United States and is it still referred to as ‘alternative content’? Melissa Cogavin: We’re still researching this but the consensus seems to be that as a whole, the US has a way to go and yes, it’s still being referred to as alternative content. There are lots of economic and social reasons why it’s not taken off – and let’s not forget they aren’t called the United States for nothing. The USA is enormous and complex, and growth in event cinema won’t happen overnight. The ECA will be working with our US members to build the awareness and support the industry there as time goes on. But let’s not forget the US is where alternative content came from, the Met started all this. CJ: What about markets like Latin America and Asia, where event cinema seems to have been slower to take off? Melissa Cogavin: At the moment these markets tend to acquire rights to content produced in the USA and Europe. There are events that are home-grown that don’t get exported as well. There are language barriers associated with this of course. 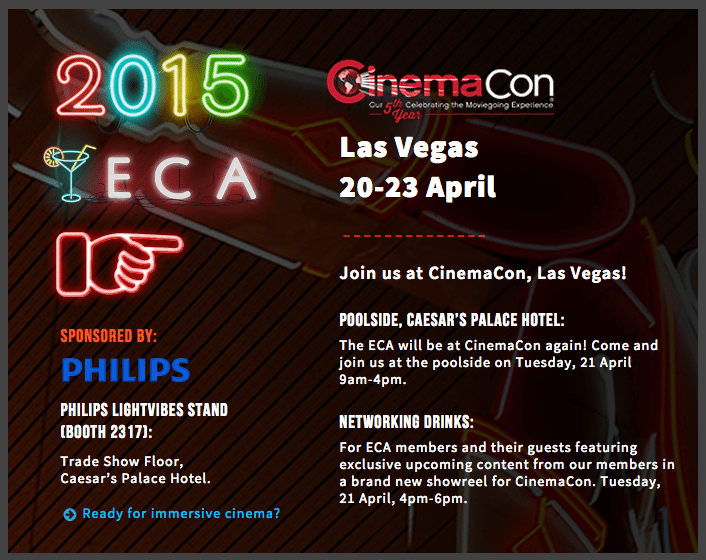 CJ: What will the ECA’s presence and activities at CinemaCon be this year? Melissa Cogavin: This year at CinemaCon we are hosting a networking event on the trade show floor with our good friends at Philips who are there to promote LightVibes to the event cinema industry. And we’re also present at CinemaCon all day on Tuesday with a cabana poolside in the fresh air so we’re looking forward to meeting and greeting our members during the day in the sunshine! CJ: Do you have any personal favourite event cinema screenings, or would that be considered favouritism? Melissa Cogavin: I couldn’t possibly comment…! CJ: In that case, thank you for taking the time to share your insights.